Abdulrahman Bashir of ABS FC has been described as a petit, hard-running striker with a massive work-rate. Few players in the Nigeria Premier League can match Bashir’s goalscoring record. There seems to be some confusion regarind the age of Bashir. According to 2muchsports, Bashir is born 25.05.1989. According to MTN Football, Bashir is born 15.01.1992. According to absfc.com, the official homepage of ABS FC, Bashir is born 15.01.1991. Personally, I think the latter is correct. The picture, found at SuperSport, is of Bashir. In what seems like a great career move, enterprising midfielder Emmanuel Bivan has joined champions Kano Pillars FC for the Nigeria Premier League 2012-2013. 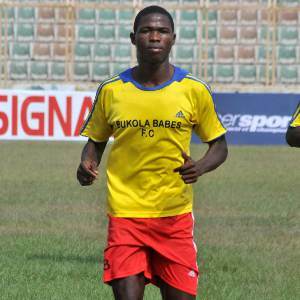 Bivan, who has captained Kaduna United FC in certain matches, loves to dribble and has good ball control. According to unconfirmed sources, Bivan is born 25.12.1992. Attacking midfielder Musa Buhari is an exciting prospect at Kano Pillars FC with his vision, dribble and eye for a goal. According to MTN Football, Buhari is born 11.09.1993. Some critics will say that Christopher Chigozie has made some bad career moves during the last couple of years. Chigozie was brilliant at Ocean Boys FC and showed that he can attack and defend, create and score, especially from deadly free-kicks. He has not been able to reproduce this form at Dolphins FC or Heartland FC. The powerful Kennedy Chinwo is versatile defender, primarily a right-back, with plenty of experience. Chinwo has an excellent right-foot and has an impressive work-rate. Pierre Coly, the towering centre-back from Senegal, was a key player for Sharks FC last season. Coly, widely regarded as one of the best foreigners in the Nigeria Premier League, is currently on the wish-list of several Nigerian clubs. Ifeanyi Ede, a physically strong centre-forward, has developed into a consistent goalscorer in the Nigeria Premier League. Ede has just turned 22 and the up-coming season, he should be able to net double figures for the first time.